We would like to start off with saying we found this delectable pudding pie on Instagram. 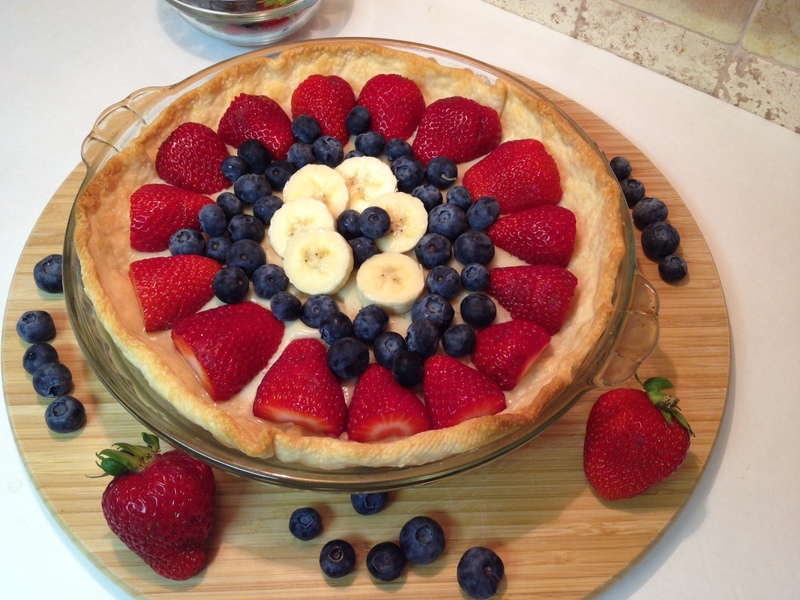 She like a food post of mine, and I went to check out her food creations and found her Strawberry Vanilla Pudding pie. Her name is Andrea and you can find more great food photography and creations of her’s at instagram.com/andrea_veganlicious. Thanks Andrea for sharing your recipe with us on Instagram. 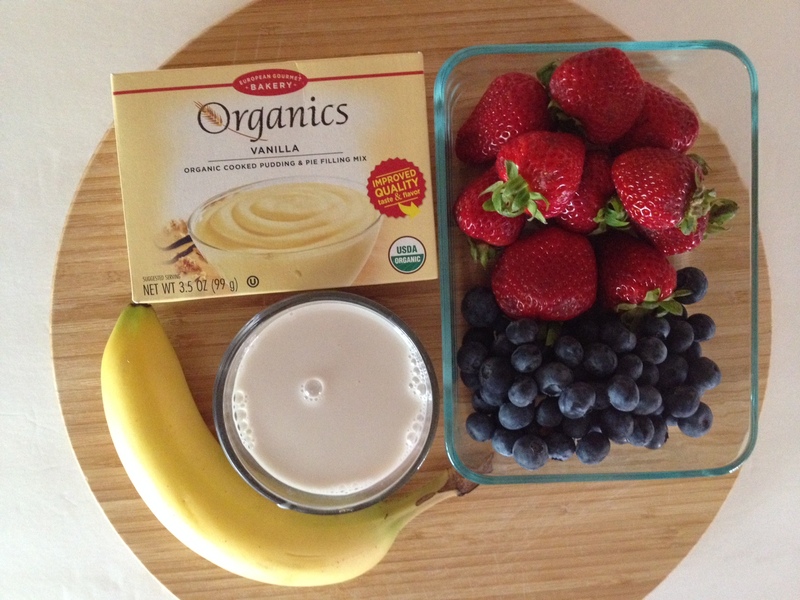 Andrea used Dr. Oetker‘s Organic vanilla pudding and in place of milk she used almond milk. Here at Splendid Recipes and More we add blueberries, and used almond – coconut milk. Bake the pie shell according to package instructions. Usually it is in a preheated oven to 450 degrees for 10 – 12 minutes. Let cool. Make the pudding according to package instructions. Replace the 2 cups of milk called for, with 2 cups of almond – coconut milk. Also the instructions say it is optional to use one egg yolk for a creamer pudding. We did add a organic egg yolk. Pour the prepared pudding into the cooled pie shell and let set in refrigerator for the amount of time the pudding box instructions call for. The pudding we used said let set for 90 minutes in the refrigerator. Slice strawberries in half, and place each slice, cut side down, around the out edge of the pie. 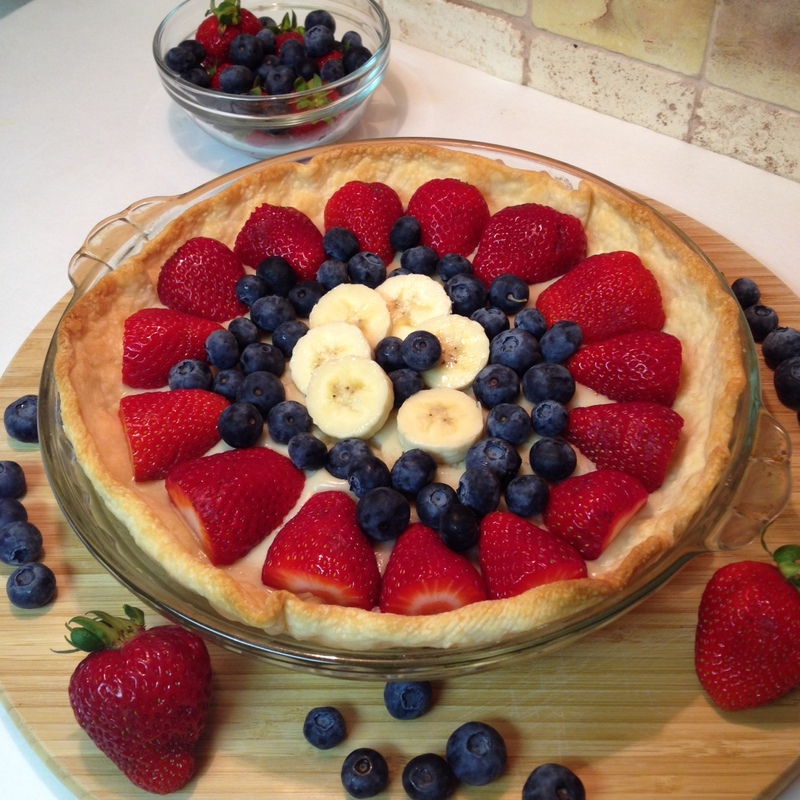 Sprinkle the blueberries around the strawberries, and place the five slices of banana in the center in a circular motion. Top the bananas with a few blueberries. Easy Recipe To Make a Boom For The Fourth!! This entry was posted in Dessert and tagged blueberries, Blueberry, Coconut milk, Egg yolk, Food, Instagram, Oetker, Organic vanilla pudding, Pie, Pudding, Strawberry Vanilla Pudding, Vanilla, vanilla pudding. Bookmark the permalink. Wow great to hear Roger!! So excited to hear that. How was your trip out and back? I love this! I’m a big berry and banana lover – BIG! I enjoy the berries as well. I eat blueberries with my oatmeal or juice them with a mango. Their in season fresh only May thru Aug. So I buy them often. Thanks for your thoughts and for stopping by Jackie. A very refreshing dessert – looks delicious. Thanks Jovina! I hope you give it a try. Oooh – I bet my girls would have fun making this! Yes and it is sweet tasting RoSy!! Thanks for the tweets as will, I appreciate it!! Thanks for stopping by. Hey if you and your girls make this post a photo of it!! I like that it is lactose intolerant recipe. I have never tried almond milk. That sounds delicious. Thanks Honey. The almond milk was mixed with coconut milk. The pudding did have a hint of coconut flavor. I hope you prepare this for yourself and enjoy it. Hey Honey, I hope your doing well. Don’t forget to check out http://www.healthnewslibrary.com, for alternative health information. I also posted a few articles on Crohn’s disease. Take care Honey. Thanks for stopping by and leaving your thoughts.